Peruvian chocolate is divine. Generally chocolate which is produced in Peru has a slightly more intense taste than chocolate found elsewhere in the world – it is renowned for cultivating the cocoa bean with care, and harnessing the typical intense cocoa and turning it into a readily-available consumable. I was surprised that Tesco even stocked this type of chocolate because it is hard to come by in Birmingham via stockists that I’m familiar with, let alone being sold in my local supermarket. It seems Tesco are upping their game, and truly offering customers a taste of the world. You might consider that a bit of a stretch, but biting into a bar of Peruvian chocolate transports me back to sunnier isles where I’d munch unfamiliar chocolate whilst on holiday. On to the bar of chocolate. Well, firstly the packing is one of luxury; a bright pink canvas is adorned with an almost aztec-like print in the foreground – it looks exotic, precious even, and merely hints at the jewel inside. Like the rest of the Tesco Finest dark chocolates range, the chocolate is encased in a thin, dull silver foil, reminding me of the more expensive chocolate eggs I used to receive as a child at Easter. 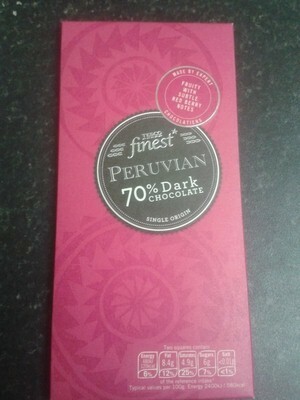 As advertised the chocolate has a deep cocoa flavour, but also a fruity, nuttiness, which is typical of Peruvian cocoa beans. 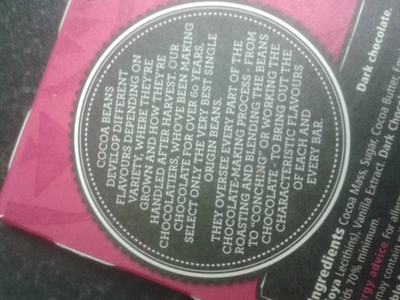 The chocolatiers who work with Tesco have truly brought out the characteristics of the bean, which linger on your tongue after you've taken a bite. You'd be surprised, but this chocolate goes down well with little ones - my niece absolutely loves this chocolate, and she's only six years old. One square is enough for little ones because it is quite rich, but if they'd like a little more, don't deny them because it's delicious. This chocolate works very well in 'rocky road' chocolate bars, as well as any sort of fruit and nut bars. I have to say, however I enjoy it melted into fruity flapjacks. Get baking.